On behalf of Wailea Limousine Service, we extend our congratulations to you. 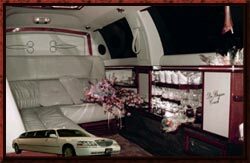 As your Wedding approaches, we'd like to remind you that now is an excellent time to reserve your limousine. Weddings are our specialty! 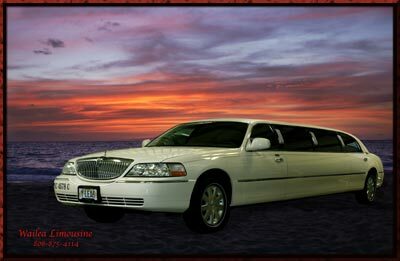 We are the #1 source for wedding transportation on Maui. We have been providing safe, reliable, elegant, transportation with an emphasis on superior service to Maui's wedding couples for over 15 years. Our staff will work closely with you or your wedding coordinator to assure your day goes as planned. Imagine a beautiful white limousine pulling up to your hotel. A long red carpet is rolled out for the two of you by a friendly, tuxedo attired chauffeur. After that, we will whisk you away to your wedding while you relax and enjoy our complimentary bar and some soothing music. Our experienced staff will cater to your every whim and treat you like the rich and famous on your special day. We are proud to offer a diversified fleet of vehicles with a price to fit almost any budget. Rates starting as low as $68.00 per hour (two hour minimum on all charters). 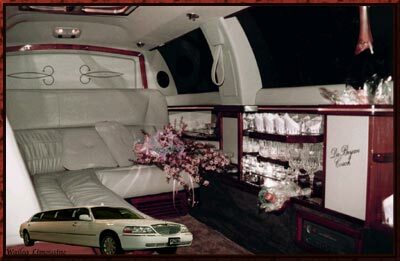 All limousines are white with a conservative classic style interior. Every limousine features TV, VCR, AC, stereo, easy ride suspension, and many more features to ensure your ride is a pleasurable one. Thanks, Janine! My parents had a great time and specifically mentioned the "great limo service" they had in Maui!